Adding pre-cooked shrimp is a delicious and healthy way to take your lunch or dinner to the next level! Whether it's an Asian stir fry or an Italian fettuccini alfredo, this versatile seafood can be incorporated into a variety of dishes and is easy to reheat. Follow the steps below to effectively heat up already cooked shrimp using only your microwave. Do I Need to Heat Up Pre-Cooked Shrimp? 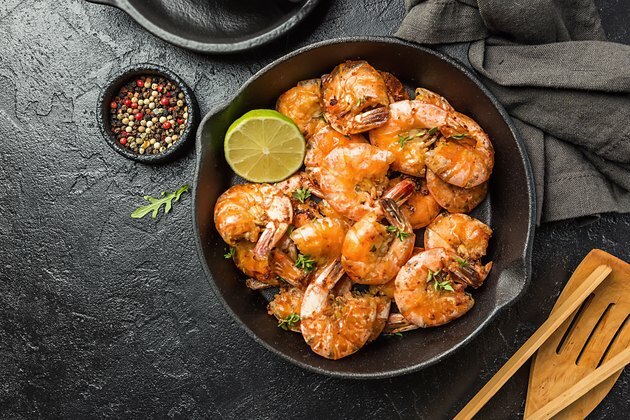 Before you toss your pre-cooked shrimp in the microwave, it's important to note that after it's been cooked once, there's no need to keep re-heating shrimp. Chilled shrimp makes a tasty addition to a cucumber soup or a summer pasta salad. It can also be turned into a delicious shrimp cocktail using only your favorite cocktail sauce. Heating pre-cooked shrimp is necessary only if it is called for in the dish being prepared or if you prefer it that way. Using the microwave is a quick and safe way to heat up shrimp that's been pre-cooked. Begin by spreading the shrimp out in a microwave-safe dish. Be sure not to stack the shrimp, but instead to use a dish big enough to accommodate a single layer. Then, cover the dish with a lid or plastic wrap to trap in steam and aid in the heating process. Place the shrimp in the microwave and heat them on high in 1-minute increments until they are warm all the way through. Be sure not to overcook the shrimp as this can make them rubbery and ruin the taste. Once the shrimp is reheated, it can be added to your favorite dish or eaten as is. How Long Is Pre-Cooked Shrimp Good For? Once it's cooked, shrimp is good for about two hours at room temperature before it should be refrigerated. Keeping it out past this time leaves it susceptible to bacteria growth and may cause foodborne illness. If shrimp has been out for longer than two hours, it's best to throw it away. Refrigerating cooked shrimp can significantly extend its shelf life. Shrimp that's cooked and stored in an airtight plastic container can last for two days before going bad. If you're unable to eat the shrimp by this point, it's best to put it in the freezer. This can extend the seafood's life up to six months. What Are the Benefits of Eating Shrimp? 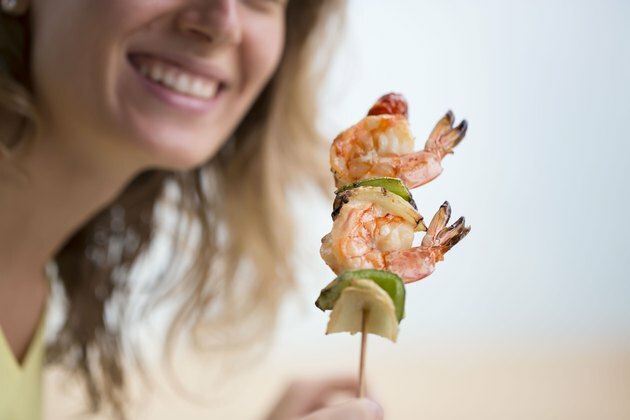 Incorporating shrimp into your diet is beneficial for a number of reasons. To start, shrimp is a relatively low-calorie food. At about 60 calories per three ounces shrimp, this seafood is an attractive option for people looking to eat healthier. In addition, shrimp has high amounts of protein. Three ounces of shrimp contain roughly 12 grams of protein. This is only a few grams less than a similarly sized chicken breast. To add to its appeal, shrimp is naturally low in carbohydrates and fats. Finally, shrimp contains a plethora of valuable nutrients. The seafood is known to provide high amounts of vitamins B6 and B12, which regulate our overall mood and alertness. In addition, shrimp has higher amounts of other beneficial minerals like copper, selenium, phosphorous, magnesium and zinc. Shrimp contains relatively high amounts of cholesterol, so the seafood should be consumed in moderation. A 3.5-ounce serving of shrimp has roughly 200 milligrams of cholesterol. This is equivalent to about two-thirds of the recommended daily allotment. Avoid cooking the seafood in butter or other creamy sauces, as this only adds to overall cholesterol levels. Instead, use healthier alternatives like olive oil. If you have questions about your diet, it's best to speak to your physician or to a registered dietitian. Leaf: How Long Does Cooked Shrimp Stay Good? Medical News Today: Is Shrimp High in Cholesterol? Tufts University: Can You Get Jumbo Benefits from Eating Shrimp?